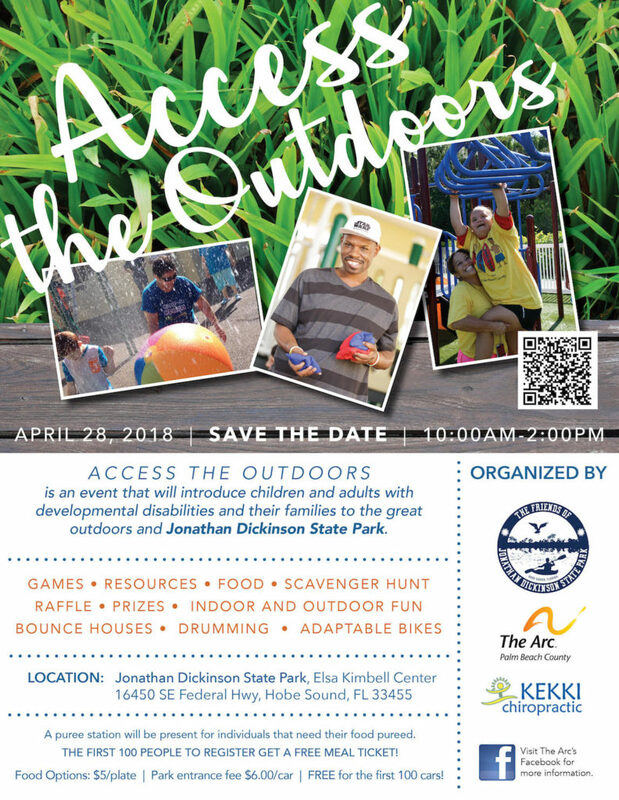 “Access the Outdoors” is an event that will introduce children and adults with disabilities to the great outdoors and Jonathan Dickinson State Park. Games, resources, food, scavenger hunt, raffle, prizes, indoor and outdoor fun. Park entry fee is $6.00 per car – first 100 cars through the gate receive free admission! Park is ADA accessible. The program takes place from 10:00 AM-2:00 PM on April 28, 2018 at Jonathan Dickinson State Park, 16450 SE Federal Hwy, Hobe Sound, FL 33455. The event is organized by The Friends of Jonathan Dickinson State Park, The Arc of Palm Beach County and by Kekki Chiropractic. The Friends of Jonathan Dickinson State Park is a community-based, non-profit organization. The Friends organization promotes the historical, educational, and ecological enhancement of Jonathan Dickinson State Park and is directly responsible for funding many park programs and improvements.